Device for dispensing and conservatio of wine is the result of an extensive research by the team from the Innovation Center of Faculty of Mechanical Engineering in Belgrade, lead by dr Milos Milosevic, and the PORT-TR company. It is an invention which allows the pouring of wine per glass, whereas the wine remaining in the bottle is kept in the shielding inert gas (argon) atmosphere, without losing quality. There are different wine conservation systems on the market, ranging from vacuum corks to so-called enomats, but most of them are non-functional. Vacuum corks have experienced a large expansion on the market, but were also quickly withdrawn since they were not able to eliminate the oxygen in the bottle entirely, and thus could not preserve the long-term quality of wine. On the other hand, enomats, devices which also use inert gases, are to bulky, of limited capacity and expensive. After analysing the market and identifying of the flaws in existing systems, our partner in this project, Bojan Lazic, presented the real demands of the market. 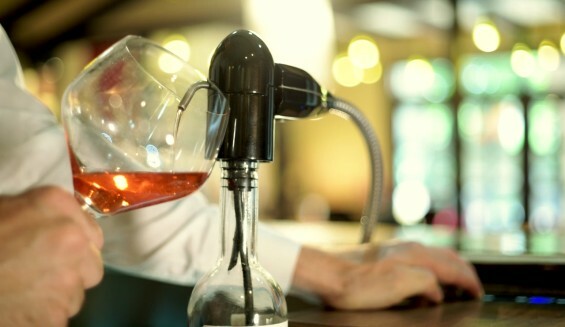 Thus, the idea was created, and based on it a device was made, with small dimensions and a relatively affordable price, which allows the restaurants to serve up to 20 bottle of wine per glass, simultaneously. In addition, there is a possibility of detaching the device from the bottle, as needed. A national patent was given to this invention by the Intelectual Property Office of Republic of Serbia, and the procedure for obtaining the international patent PCTRS2015/000019 is currently underway. Innovators: Milos Milosevic, Bojan Lazic, Uros Tatic, Simon Sedmak and Jasmina Perovic. © 2010. Inovacioni centar Mašinskog fakulteta d.o.o. All rights reserved.